We are located in Rutherford, NJ. We are 30 minutes away from Manhattan, and within 30-60 minutes away from surrounding tri-state areas. What type of cats do you breed? We breed Balinese and Siamese cats in an array of traditional and rare color points, with our concentration being in that of the Balinese breed. At times we breed Siamese cats and Balinese short-hair's better known as Balinese "variants". How are Siamese & Balinese cats in personality? Like humans, all cats have their own personality and the Balinese cat is no exception. While this is the case, Balinese cats tend to be great companions by nature. Like Siamese cats, they tend to be very caring, curious, and creative. They will follow you everywhere when given the chance, and be vocal in asking for attention when wanted. If you don't mind someone constantly nagging at you to open the door for them to be part of your activities, then this is your ideal cat. Are Siamese and Balinese cats Hypoallergenic, and do they shed? Though much emphasis is partaken on the matter of allergies and hair length, it has no connection. Like humans and animals, it is as well normal for Siamese and Balinese cats to shed. They do not shed in extreme amounts, like Himalayan cats, or other long-haired cat breeds do. The culprits in causing cat allergies in humans is due to the protein allergens, Fel d 1 & Fel d 4 which is basically, cat saliva and urine. There is hope for cat lovers and people allergic to cats alike. There are only a very few cat breeds, the Balinese included that genetically produce less of the cat protein allergens. For this reason these types of breeds are referred to as Hypoallergenic; or less prone to causing an allergic reaction. Though some website's and people claim other cat breeds such as the Siamese, Spynx, and Bengal to be hypoallergenic, they are not. A Spynx cat is actually worse for cat sufferers due to the allergens sticking to the cats skin and having no way to remove itself with normal hair shedding. Why are Siamese cats not considered Hypoallergenic and Balinese cats are? From past experience and countless testimonials, a Siamese cat is not essentially Hypoallergenic. There is a theory that the genetic mutation that caused the long-haired Siameseor Balinese; it as well produced a cat that genetically produced lesser amounts of the protein allergens. 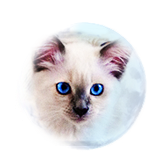 Claims are that unless a Siamese has Balinese bloodlines-has a higher concentration of Balinese blood, that they are not going to be hypoallergenic, which is why we advise; and some people prefer to acquire a true Balinese kitten out of a Balinese X Balinese breeding rather than Siamese X Balinese. There is no proven research on this, though past Siamese/Balinese cat owners and breeders claim/experiences provide proof where they noticed that the Siamese caused allergic reactions and the Balinese did not. We have produced short haired, "Siamese" kittens that are hupoallergenic and this is by breedig our true/pure Siamese cats or short haired Balinese cats to a true Balinese cat male. There is a lesser probability of a short haired cat being hypoallergenic but we have had past kitten parents that have acquired these kittens that do very well without any allergy problems. What color points do you breed for? We breed for the primary color points available to the Balinese breed which includes the colors; seal, blue, chocolate, and lilac. We also breed other rare colors like that of the Balinese Lynx "Wild Cat" points which are considered a breed in itself under the name "Javanese." We also aim to breed for other rare colors which are of future development or goals between other trusted hobbyist breeders. How blue are the eyes of your kittens? How important is this for a Siamese/Balinese cat? 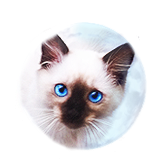 All Siamese & Balinese cats have a blue eye color. If they do not have blue eyes, they are simply not Siamese or Balinese cats. Though it depends on genetics, health, care, and diet, the blue coloration in both Siamese & Balinese cats range from a light cerulean blue to a deep azurite blue color. This should not matter much to the person seeking a pet-quality companion, but it is of great importance for those breeding, as they would want to choose the best eye color to produce kittens with eyes of the darkest blue possible. Another point to keep in mind is that eye color is also affected by the factors mentioned above: care, health, and diet. Many times have I seen a Balinese kitten's blue eye color change depending what they are eating and if they are receiving enough sunlight. As we humans eat different variations of foods, our skin and even eyes can change in color and tint, and the same happens for these felines. Kittens also tend to develop a deeper eye color as they age, I have seen this many times and many breeders can attest to this happening in their kittens & cats. What are your current breeding goals? As breeders interested in preserving and improving the Balinese breed, we have many goals we would like to achieve. Not all Balinese cats and their lines are created equal, and it is up to those specializing in the breed to focus in improving these lines if not preserving them. We are currently aiming to continue to improve our lines in any way we can in terms of purity, and also introduce color points not yet available in the breed and/or currently present here in the United States. For more information on our breeding goals, please visit our Breeding Program. Yes, our cats are registered with CFA (Cat Fanciers Association) and CFF (The Cat Fancier's Federation). 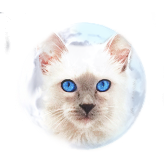 We are also registered with the FiFe cat association in Europe that is the only cat assiciation at this time to recognize and register the true W67 Foreign White Balinese cat. 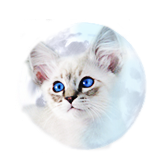 The FiFe does a great job in truly differentiating between the White Oriental breed cats and true white Balinese which is why we are registered with them and register our Ivory points with them. Our goal is to remain registered with the registry/club that better represents the Balinese breed in its Old-Style/traditional standard, so far this has not been accomplished due to the "modernized" standards that these registries currently endorse and support. Do you sell cats for breeding purposes? No, we do not sell nor have interest in selling kittens for breeding purposes. All our kittens leave our home with an altering (spayed or neutered) agreement PERIOD. The reason for this is that we do not want to contribute to the irresponsible breeding of cats. There are enough kittens/cats in animal shelters. We have also found that not all breeders are created equal and we are very strict as to who gets our breeding lines. We would like to keep our lines pure, as well as genetically diversified and giving our breeding lines to others carries the risk of lines concentrating, inbreeding and future genetic problems to the breed as a whole. We have seen this occur in the past and the effect in lack of new breeding stock for the future, which can be very detrimental to the breed. We also do not feel it is fair to "pass on" breeding stock to irresponsible breeders that just care in producing kittens without contributing to the breed positively. There could be exceptions to this rule depending on our present breeding program but we feel it is best to enforce it for the sake of the breed and to avoid problems with other “breeders” of cats. Please keep in mind that cats with "breeder rights" are not pet priced due to the seriousness and granted rights to breed them and at times can be up to 2x-3x the regular pet price. Though it is best to try to avoid stud services and close contact with other "unknown" cats, we understand that sometimes it is necessary in order to diversify and improve breeding lines. For this reason, many reputable breeders abroad still allow stud services to experienced cat breeders. We know of a couple of reputable breeders in Europe that provide stud services depending on the breeding program and need, and we believe the same that in order for us to even consider stud services it would have to be depending on our breeding program, need, or interest. Can we visit your home/cattery and choose our kitten? Due to the popularity and demand of our Balinese cats and our breeding program, we always have multiple inquiries of prospect kitten parents wanting to visit our home to meet the wonderful Balinese cat breed. Whether it is to meet these beautiful cats in person, choose your kitten or to test their hypoallergenic quality, it is worth the visit. For the sake of our cats, their health and ours, we cannot risk having just anyone and everyone too close in contact with our cats because of bacteria, and/or viruses that can be carried through humans, and other animals. There are viruses that can affect cats like that of feline herpes and diseases, and we try to reduce their contact with them by keeping our pets indoors, vaccinating them, and keeping strangers afar. Being that we do receive multiple inquiries, we cannot accomodate everyone for a visit on a specific time and/or date. Please keep in mind that though we do this full time, it is not our profession nor is it our primary income. We have regular lives with jobs to do and errands to run. Our breeding program is home based and our cats have free run of our home. We do not keep our cats in cages, nor kennels for people to visit them like in a zoo. Visit appointments must be made with at least 24 - 48 hours in advance notice. Visits consist of seeing 3 adult female cats; time permitting only. We cannot show you each one of our cats in our program as it can be stressful to our cats. Kittens can be seen/visited by those on our waiting list choosing kittens only, no exceptions. Kittens can only be seen from an age of 8 weeks and after they have received their first set of core vaccines. Why are pure-bred Balinese kittens high in price? Prices for Balinese kittens will vary depending on factors like the breeders’ location, quality, expenses, demand, and investment. Some breeders might sell you kittens that have had thorough veterinarian care, and some might not include vaccinations, socialization/training, or micro-chipping, and endless future breeder communication. Every breeder operates in different ways and prepares their kittens according to their own beliefs and standards. For this reason pure-bred kittens are higher in price than other kittens/cats because of the expense in producing such kittens that are pure in breed and of higher quality. You cannot compare a shelter cat to a pure-bred cat with a breed standard, nor their quality of health and personality. I try to always suggest to interested clients to please do their research and make their comparison in accordance to quality, location, shipping expense, and breeding program of the kitten(s). Though you might rarely find Balinese kittens at a lower price, you should find suspicious to find true and purebred kittens going for lower than $700.00, and you have to consider shipping as an added expense. Please keep in mind you do get what you pay for. How much do you sell your kittens for? We try to accommodate the best we can in terms of kitten prices, but please be aware of the much time, care, and attention that has been invested in these kittens by us to ensure their health and potential to be great pets. Nonetheless, running a quality breeding program has its increased expenses like that of food, medical care, and needed supplies which varies depending on the breeders location of residence. Owning quality breeding lines also runs a big responsibility in that we can continue to provide the best kittens for the future. Quality under a breeding program is defined as: A responsible breeding program, genetically sound lines, healthy cats, personality and eye color. Though we do not sell kittens with breeder rights to just anyone, we do understand the importance of working with other like minded breeders in the effort of preserving, diversifying and improving Balinese lines. Prices are generally 2X-3X the pet price which is the standard and depends on quality and rarity. Other arrangements can be made such as a kitten trade and/or kitten back on a case by case decision. Please contact me for further information if interested in breeding stock. With the above said, we hope that you can find our prices suitable to your search for a cat with unique and rare qualities and one that was carefully raised, trained, and tended to, and hope that you do not ask for discounts nor try to bargain with us in pricing as this would not be fair to us or the breed. Yes, we do have a waiting list even though we do not reveal it in our website for your privacy. Our waiting list for kittens is a first come, first serve reservation. 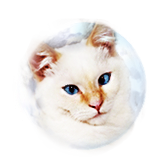 We generally try to have kittens in an array of color points available, but a waiting list ensures you will be guaranteed a kitten from a future litter and notified when we have exactly what you are looking for in terms of color point, gender, and/or a specific breeding of our cats that might interest you. In order to add you to the waiting list, we take a non-refundable reservation deposit of $500.00 to insure your serious interest in being added to the waiting list. This waiting list deposit will be included in the total purchase price of your kitten. To be added to our kitten waiting list, please use our contact form and do not hesitate to take our Bali Quiz as well! How can I reserve a kitten? In order to take your serious interest in one of our kittens and reserve a kitten for you, a reservation deposit in the amount of $500.00 is necessary. This ensures that your request will be taken very serious and that we reserve the kitten you are interested in adding as an addition to your family. The reservation deposit is added to the complete price of your kitten at the time of pick up or shipping. The reservation deposit is non-refundable if you later decide to cancel your reservation with us or do not wish to wait for a kitten from a future litter. Yes, our veterinarian’s office is The Verona & Montclair Animal Hospitals, located in Verona, NJ. We did much investigating and research, to finally find a very serviceable veterinarian office, that can cater to our breeding program. We visit our vet, Dr. Brazer only when needed so to avoid the serious risks of diseases, parasites, and fungus that may enter our home by the means of cross contact with other cats and pets. 1 or 2 year Genetic Health Guarantee against any congenital defects. What veterinarian care will my kitten have received? Kittens will be given appropriate veterinarian care throughout their growth period. Your kittens should have received 1 or 2 core vaccines by us (feline rhinotracheitis, calicivirus, panleukopenia, and chlamydia) by the time it leaves our home. Your kitten will also go home along with a health registration certified by our veterinarian for your records. Your kitten will have been micro-chipped. Do you alter (spay/neuter) your kittens/cats? As mentioned, we do not wish to contribute in having cats bred irresponsibly to find inferior and/or sickly lines appearing throughout the breed; or find them in animal shelters. There are enough kittens in shelters that deserve a home, even if they are not a pure-bred kitten. For this reason ALL our kittens and cats leave our premises with an altered (spay/neuter) contractual agreement. Though my kittens do not leave my home spayed or neutered, my veterinarian recommends that female kittens get spayed at no earlier than the age of 6-7 months of age, with males being neutered at 4-5 months of age. Your kitten/cat should also receive the pre surgery neccesary blood work and vet check in order to confirm your kitten/cat is ready for such a procedure. Older and retired breeding queens and kings will be altered prior to being rehomed unless they will be relocated to another breeding program. Do you believe in early altering (spaying/neutering)? Early spaying/neutering is an old practice that initiated around the early 1900s and the American Veterinarian Medical Association according to the CFA’s article on spaying/neutering also endorses it. Some people believe that the side effects associated with spaying/neutering cats/dogs are that s/he will become either obese or less affectionate when older, which is not the case. After many tests and observations made throughout the past decades, cats grow up to be exactly the same if they were spayed at an older age. We do agree that by having them spayed/neutered at an early age it reduces much of the stress associated with the procedure due to their young immune systems compared to a kitten at 6-12 months of age but we have decided along with what our veterinarian reccomends that it is better to wait that a kitten developes a stronger and well developed immune system prior to the procedure occuring. Why are your kittens micro-chipped? As breeders, it is our concern to ensure that our cats will be with their respectful owners at all times, and have us not hear of any devastating news that our adopted kittens/cats were lost, or found to be at a shelter ready for euthanization. For this reason we feel that one way to avoid this is by having our kittens/cats micro-chipped in case anything were to happen in the future. We know that as a responsible pet owner, you will not be allowing your cats to be outdoors, but we also understand mistakes can occur where a cat could escape, get stolen, and/or get lost. Micro-chipping is one way to reduce the risk of your loved pet getting lost, harmed, or even killed if that were to occur. This also allows us to re-home a kitten/cat if it ever is found abandoned for any reason. All of our kittens leave micro-chipped with the Microchip ID Systems “PRO-ID Mini” Microchips, the best microchip ID system we have found for our kittens, and your future peace of mind. According to our kitten contract, our kittens are guaranteed to be in good health and without genetic defects at the time of pick up. Kittens are to be taken to a licensed and experienced veterinarian within 72 hours from the date of pick up. This helps ensure that the kitten is in overall health and is required in order for our genetic guarantee to remain in place (see question below). What is your Genetic Health Guarantee? We have researched our breeding lines and goals so to feel comfortable of what we are producing in kittens, but understand that it is only fair to guarantee our kittens to remain genetically sound after it leaves our premises. For this reason our genetic health guarantee remains in place for 1 year from the birth date of the kitten. We also feel it ensures that our breeding program remains in great shape if something were to occur during this time period so to make changes to our breeding program, if necessary. What is your Extended Genetic Health Guarantee? We understand that an extended genetic guarantee can be more comfortable for some people for the better good of your pet which is why we also offer a 2 year genetic guarantee with a contractual agreement in feeding your kitten Life's Abundance for the time period of 2 years. For those already interested in permanently feeding your kitten Life's Abundance, this automatically extends your pet's genetic health guarantee for 1 additional year. Not only do we believe in good nutrition but we feel that a pets diet can beneficially or detrimentally affect a pets genetic health due to chemicals, pesticides, and low quality ingredients in today's pet foods that can alter a pets DNA. For this reason, we feel that if even by feeding Life's Abundance food that something wrong were to occur genetically in your kitten, it would be just to replace your kitten with a kitten of same value. Please keep in mind that kitten must be solely fed Life's Abundance brand food to not only ensure your kitten has no health and digestive problems but in order to comply with this agreement. Food must be purchased through autoship and compliance will be monitored through Life's Abundance ordering sytem notification that is sent to us. For more information on this extended genetic health guarantee, please see our contract. Why do you feed and promote Life's Abundance? We have researched and informed ourselves on the types of food available and the best kinds to feed our cats. Thanks to a couple of fellow breeders here in the U.S. who recommended this food to me and through my own efforts of trying to find the best food out there, I have found that Life's abundance is indeed a superior food in comparison to food that can be found at local supermarkets and pet stores. Life's Abundance foods are produced in fresh small batches, rather than commercial brands that produce food that does not reach your household after months if not years. For more information on Life’s Abundance visit our Care & Nutrition page. Why do you sell your kittens with a contract? The majority of reputable cat/dog breeders use contracts due to the headaches and problems that can arise without having a written document. Like any general sale or agreement it is best to have something in writing to avoid future disagreements or problems. I have heard horrible stories of breeders dealing with "impossible" people, including other “breeders” in their wish to purchase a kitten. Some people will make the most creative stories and or excuses to situations not covered under a contract and cause much harm to not only a breeders’ reputation but their beloved cats if they are not dealt with professionally with means of a written agreement. Please keep in mind that a contract is a legal binding document, even if it involves the sale of animals. Do you sell adult cats instead of kittens? Yes, we will at times in the future have a young adult kitten or adult cat for sale. The reasons might vary depending on the situation but we might either have a breeder cat that we might wish to have spayed/neutered in order to retire and place at a loving forever home. We do not expect to keep our beloved breeder cats as breeders all their lives and do expect them to go to a wonderful home if we are not able to keep them at ours. Our breeding program might also change where we might have to retire a breeder cat to a suitable home as well. Though this might be very hard for us, we also understand that it is part of the cat breeding process. Adult cats available go through the same protocol as kittens in terms of finding them an ideal home and in contractual agreement if not otherwise stated. Our payment methods are only by means of cash or a bank-certified check. For more information see our contract. Though, we would like our kittens to go to people here in the states, we are aware that people might have trouble finding Old-Style Balinese/Javanese cats where they live abroad and we do not mind in shipping our kittens here in the states or abroad when possible. Shipping varies depending on airlines carrier but ranges from $175.00-$400.00 or more. For more information on shipping, please see our contract agreement. We are also able to “personally” deliver the kitten to you if you are within driving distance from us or if we plan on visiting a state or country abroad. For more information on personal deliveries you would have to contact me directly to see what arrangement we can make mutually. Do you declaw your cats? Thoughts on declawing? We do not support nor believe that kittens/cats should be declawed, period. There are many risks in allowing a cat to become declawed and believe it should not be the last resort to remove your pet’s claws. Cats are born with claws and should keep them, and the occasional nail trimming should suffice. There are many factors where a cat might need to use its claws, even in defending itself from other animals.There are many behavior situations that can easily be cured without the means of declawing a cat, thus saving the cat from losing its claws or its home. If you prefer to care more for a non-living item such as your furniture; then to be very frank, a cat or even a dog is not for	you, and I would advise you to get a fish as a pet or not get a pet at all. If you decide to acquire a kitten from us, and we later find out that our kitten(s) have been de-clawed, we will enforce our contract to the maximum with both our and your local authorities.